Ponds look great during the day with the bright sun highlighting the glimmering waterfalls and catching the subtle sparkle of its fish, but what about at night when it is dark? Most people are missing out on how beautiful a pond and surrounding landscape can be with a professionally installed low voltage landscape lighting system. 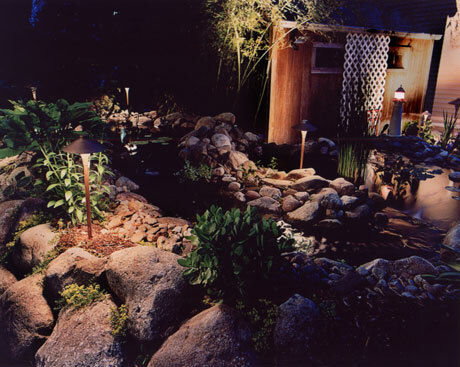 The art and science of low voltage landscape lighting has evolved to a point where it is possible to transform any pond and the surrounding property into a dynamic nighttime scene of breathtaking beauty. Strategic placement and proper selection of lighting fixtures will ensure an elegant night-time scene. Properly sizing a transformer and wire is most important. Always consider the opportunity to add more lights. 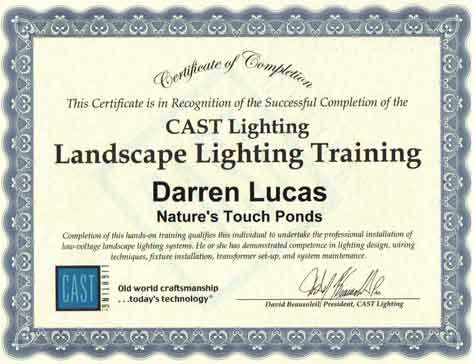 There are numerous methods to illuminating your pond. We do however discourage installing underwater lights in ponds. They will become covered with algae, can be hard to service, and are subject to corrosion. Also, for every foot of depth that the fixture is placed approximately 50% of the brightness or foot candles are lost. This lighting effect is murky at best. 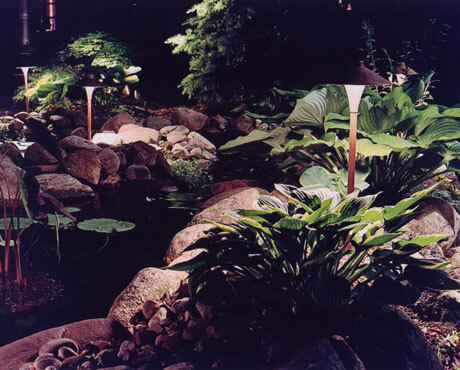 The following lighting design techniques will accentuate and enhance the natural beauty of any pond. · Reflective Lighting - Select objects that can be seen reflecting on the pond surface, such as rocks, plant materials, trees, statuary and structural features. Then by up lighting or grazing these objects a beautiful reflection is seen in the pond. · Moon Lighting – By installing fixtures in a nearby tree, a natural moonlight effect will create shadows from branches and leaves onto the pond. Remember to install the fixtures within the tree canopy to get the best shadowing effect. 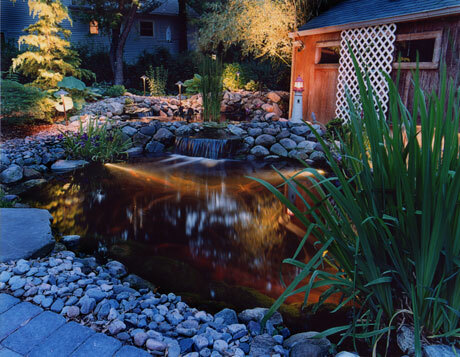 · Path Lighting – Lighting paths around the pond defines the pond edges and creates reflections in the water. There are numerous path lights available from various manufacturers. Keep in mind the path lights should enhance the beauty of the pond and not clutter the scene we are trying to create. · Waterfall Lighting – Bullet or deck lights that are strategically placed will make any waterfalls explode with sparkling dazzle and will complete the nighttime scene. · Security. High voltage floodlights leave dark shadows and unseen areas around a property. A better choice is strategically placed low voltage landscape lighting fixtures that provide proper levels of even illumination. · Safety. Low Voltage lighting is the ideal choice for illuminating walkways and entranceways. This ensures that residents and visitors can safely navigate around the property. · Usability. Illuminating the private areas of a property allow the evening enjoyment of decks, sitting areas, and recreational spaces. The flexibility of low voltage landscape lighting provides the opportunity to add, relocate and adjust fixtures easily and inexpensively. · Beauty. Low voltage lighting accentuates the shapes and textures of a landscape and its structures. Lighting designers not only paint pictures with light, we create dramatic scenes that give the viewer a dynamic experience of their pond and property. · Economy. Low voltage lighting consumes about 1/3 the electricity and costs about 1/3 to install and maintain and has as compared to high voltage systems.